Pope Francis has said that building walls to keep immigrants out of a country is not in line with the Gospel. As usual, Pope Francis responded to a variety of questions during the in-flight press conference on his way back to Rome, and this was part of the Pontiff’s response to a question relating to the upcoming presidential election in the United States and the candidate and business leader Donald Trump’s idea to build a wall to keep out Latin American immigrants. 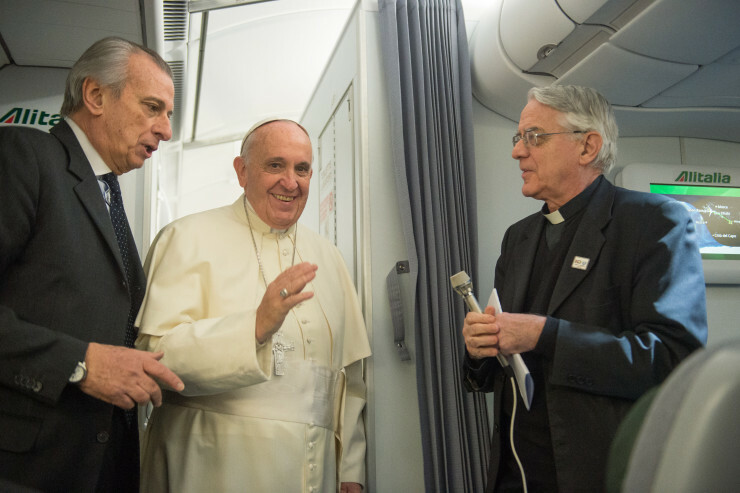 Returning from the Apostolic visit to Mexico, Feb 12-17, journalists on the papal flight asked the Holy Father questions on a variety of topics, including what may be ahead. Francis didn’t shy away from any questions, including those related to Donald Trump, pedofile priests, Zika virus, the divorced and remarried, and St. Pope John Paul II’s friendship with a female American philosopher. During the briefing, the Pontiff also expressed his interest in visiting China and meeting soon with the Grand Imam of al-Azhar, Ahmed el-Tayeb, and paid homage to his predecessor, Pope Benedict XVI. He addressed press attention regarding a close friendship that Pope John Paul II had with an American woman. The Pontiff noted that if a man is unable to have such good friendships with women, then he is one “who is missing something” in his life. When the Pope was questioned about immigration and about Donald Trump’s threat to build walls along the nation’s southern border and his having called Francis ‘political,’ the Pope wouldn’t comment specifically on the candidate or the election. When an American journalist asked the Pope why it seems that a merciful Church could forgive the sins of a murderer more easily than someone who divorces and remarries, the Pope noted that the post-Synod document on the family should be published before Easter. He said it will address the question of the need for better marriage preparation and the problem of marriages breaking down. Francis lamented how often if a woman is pregnant, couples experience pressure to get married right away. He recalled that as bishop of Buenos Aires, he told his priests that until the couples were ready to commit to each other for the rest of their lives, to delay the wedding date. He also discussed the Church in Ukraine’s response to his meeting with the leader of the Russian Orthodox Church, Patriarch Kirill, in Havana, Cuba, and their signing of the joint declaration. Francis also condemned those that use the Zika virus, which especially across Latin America is thought to be causing birth defects, to justify loosening laws regarding abortion. He warned that it is always wrong to use abortion to justify a lesser evil and goes against doctors’ Hippocratic oath. The Pope also responded to why there was not a meeting with relatives of the 43 Mexican student teachers who went missing in Guerrero state in 2014. While reminding the Mexican journalist of how he strongly condemned in his discourses the problems of assassinations by gangs and drug traffickers, Francis expressed that he was willing to meet with the relatives. However, he explained, the encounter didn’t take place because there are many groups representing the ‘desaparecidos,’ and among these groups, there are internal conflicts. Responding to a question about the problem of sexual abuse of children by priests in Mexico, Francis called bishops who knowingly move priests accused of abuse ‘irresponsible’ and said they should resign. Francis also used the opportunity to praise the intense efforts of his predecessor Pope Benedict XVI to combat this, and noted the actions he has taken with the Pontifical Commission for the Protection of Minors, Council of Cardinals, and Congregation for the Doctrine of the Faith. At the end of the questions, Pope Francis and the journalists thanked Alberto Gasbarri, who is retiring at the end of this month after having served as organizer of papal trips for the past four decades. ZENIT will publish the Vatican’s full translation of the in-flight press conference once it is available.